Former socialite Lola Woodby, not-so-discreet private eye in Prohibtion-era New York City, along with her grim Swedish sidekick, Berta, take on a piece-of-cake job: retrieving a rhinoceros trophy from the Connecticut mansion of big game hunter Rudy Montgomery. After all, their client, Lord Sudley, promises them a handsome paycheck, and the gin and tonics will be free. But no sooner do they arrive at Montgomery Hall than Rudy is shot dead with a houseful of suspicious characters standing by. Lord Sudley ups the ante, and Lola and Berta take the case. Armed with handbags stuffed with emergency chocolate, gin flasks, and a Colt .25, Lola and Berta are swiftly embroiled in a madcap puzzle of stolen diamonds, family secrets, a clutch of gangsters, and a flapper who knows her way around a safari rifle. 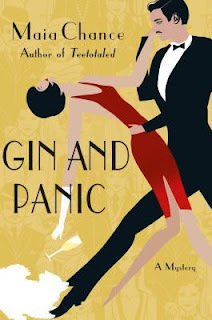 Gin and Panic is my first foray with the Discreet Retrieval Agency cozy mysteries, although the third book in the actual series. I admit to not being sure what to think when I first started reading Gin and Panic. Retrieving a rhinoceros head for a client wasn’t the most appealing start. However, the more I read, the more I invested in the novel I became. Lola and Berta are quite the private eye pair. Set in the roaring twenties, it is easy to see how these two women fit into it—no one taking them seriously enough, which only gives them more of an advantage. The mystery itself was twisty and fun. Just when you think it is going to go one way, it goes another. While I wasn’t surprised by the outcome, I sure had a good time getting there. It was hard not to laugh my way through this one what with the humor and rather eccentric characters. This mystery had a bit of everything: murder, theft, gangsters, socialites, a con artist radio talk show hosts, romance, and two heroines I couldn’t help but cheer for. You can learn more about Maia Chance and her books on the author's website. She can also be found on Twitter and Facebook. Sounds like a really fun mystery and something that I'd enjoy too! Thanks for the review, I'll have to keep an eye out for the book! For some reason hearing about the two women characters reminded me of the chemistry between Stephanie Plum & Lula. Those two are a blast. Now you've got me very curious about checking this one out! Iliana - Haha! I can see that. Although these two are a little more proper. :-) I hope you enjoy the series if you give it a try! I love mysteries with a touch of humor! Kathy - I do too! The boom sounds fun. I think that my wife would like this as she likes mysteries set in this era. I will send her the link to this book. Brian - I enjoy this time period as well. I hope your wife gives the series a try, and enjoys it! I love that cover! I hadn't heard of this series until now but I really want to check it out! Sam - It's new to me as well, but definitely one I would like to follow. Sounds like a fun read. For some reason I'm intrigued by those Golden Age mysteries so will have to check this out. Melody - There's just something about the time period, isn't there? This was a fun one, and I can't wait to read more! Sounds like a fun series, I like the cover. I've read the previous two books in the series and enjoyed them. Lola is such a nut and I love Berta! Glad this one was entertaining. I'm looking forward to reading it! Have you tried the fairy tale mysteries by Chance? The series has ended but they're a lot of fun too though not quite as zany as these. Katherine - I need to go back and read the earlier books now. I really like Berta as well. :-) I haven't read Chance's fairy tale series, but I want to. Thanks for recommending them! Ah, this is the famous "Gin and Tonic", er, "Gin and Panic" book! Lol. The title itself is fun! I do think I should try this one. I've been FOREVER declaring that I will DEFINITELY read a cozy mystery, after all! So I might very well jump into this one, as it sure does look like a fun read. Besides, I do like this time period. Wendy, this line from your review had me chuckling: "Retrieving a rhinoceros head for a client wasn’t the most appealing start." LOL. This wouldn't appeal to me, either! :) I'm glad you stayed with the book, though, as you did end up enjoying it! Maria - Cozy mysteries often have the best titles, I think. At least for plays on words. :-) I hope you do give cozies a try. They can be a lot of fun. Thanks for visiting, Maria!